The UKIP is trying desperately to win votes from Labour. That’s probably why they’re doing everything they can to pretend they won’t sell off the NHS quicker than the present government if they win power. 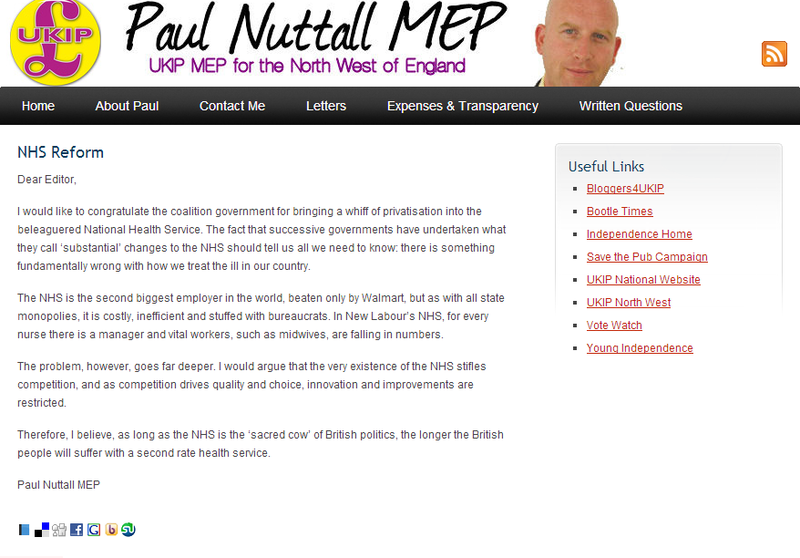 As part of this cover-up, UKIP leader Paul Nuttall has sneakily deleted a letter he posted on his own website calling for the wholesale privatisation of the NHS. UKIP are not a maverick, anti-establishment party. They’re a bunch of right-wing, authoritarian Thatcherites – led by a public school educated ex-banker – who don’t like foreigners or homosexuals much. And they’d sell-off the NHS quicker than the present government given half a chance. Why isn’t anyone discussing the NHS? Lol, according to several major studies, the NHS is the most efficient healthcare system in the world. But don’t let facts get in the way of an ideological fairytale. Ironic since UKIP have more than once discussed their plans publicly of privatising the NHS – or as they like to put it – open the NHS up to market competition; kind of a Tory max plan. Thatcher began the public/private partnerships; Blair ran with them; Cameron is finishing off privatising the NHS. Each party has played its part in dismantling the system from within.The huge bureaucracy was put in place to do just that. There is no-one defending the NHS. We are living in a one party state with only slight differences between them. There is a point that needs to be ‘driven home’ to potential Labour-voting defectors. Farage is not just a Thatcher-loving ex-banker — he’s a ‘spiv’. “Competition drives quality and choice”. In an ideal world, yes. We don’t live in an ideal world. We live in a world of money-grabbers and takers who will sell anything and everything. Especially the hard work of the skilled. The bigger a company gets, the more it distances itself from the consumers, the skilled become lowly paid and the fatcat in power waddles off into the sunset with a huge pot of money and a lack of conscience. In my experience of the NHS, I have nothing but highest praise. I have been very grateful for what has always been a wonderful institution, started for the noblest of causes. I dread the thought of UKIP and Tories becoming a coalition – I could think of nothing more hellish. I wish everyone would just vote Green. Mainly to see the look on Dave’s shiny little face with his little round eel mouth in a horrified silent scream. What is the relevance of Farage being privately educated? none, just another nasty bit of left-wing name calling. The more private involvement in the NHS the better. It was set up in 1948 baddly, and we have suffered the consequences ever since. Both Conservatives and Liberals would have introduced an NHS in 1948, but their’s did not involve the wholesale nationalisation of the system. Now with some proper consultation we could have a decent European system: free at the point of use, but state, charity and private businesses involved in provision. The privatisation of the NHS has already began, thanks to Cameron. With the EU and America holding talks on its way forward, the damage has already been done. It’s a shame the demonstrators didn’t target the party responsible for its privatisation, i.e. the Tory party. They are the ones that have killed the NHS, NOT UKIP. Actually, I would argue that privatisation of the NHS was begun under Major and continued through Blair but I still agree with your point. My issue with UKIP is that they have plans to completely privatise it without any way to go back. I just pray that these far-right loons never get in to government. Sounds like a middleclass party run for the benefit of the middle calss to me! He is an opportunist who has the sense to know that the electorated are fed up with mainstream spivs. Does anyone know when Nuttall wrote the letter ie date going to write to Wigan Evening Post ? Except he didn’t post anything calling for the wholesale privatisation of the NHS and it is the conlablibdum party so in favour of TTIP that will lead to wholesale privatisation of the NHS, lets get some fact right if you want an NHS you can’t vote con lab lib dum or green because they are all wholly in favour of the eussr and its dreadful trip which will give american companies a huge advantage in the corruption ridden democratically deficient bloc. Reblogged this on John D Turner. Still rabbiting on about something he posted 4 years ago and has never been adopted as UKIP policy, it really gets boring when you consider the way in which the coalition and labour before them outsourced i.e. privatised so much of the NHS, by the time UKIP get in the old three parties will have done the job anyway so why the constant boring repetitions?